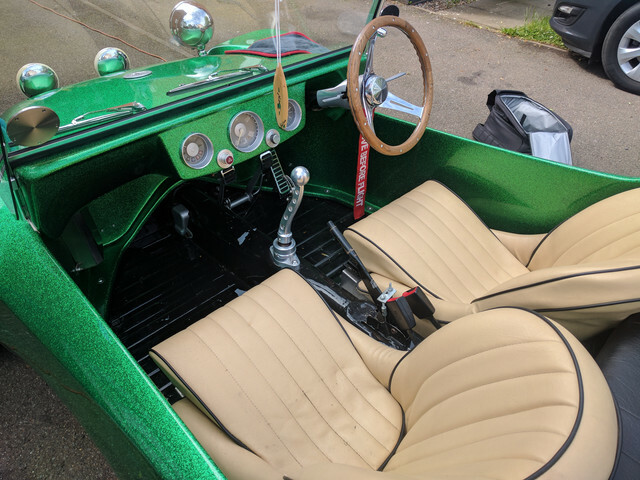 This is a discussion for the topic Green Corvair Sidewinder Buggy on the board Beach Buggies For Sale. A very reluctant sale, but a sale nonetheless. 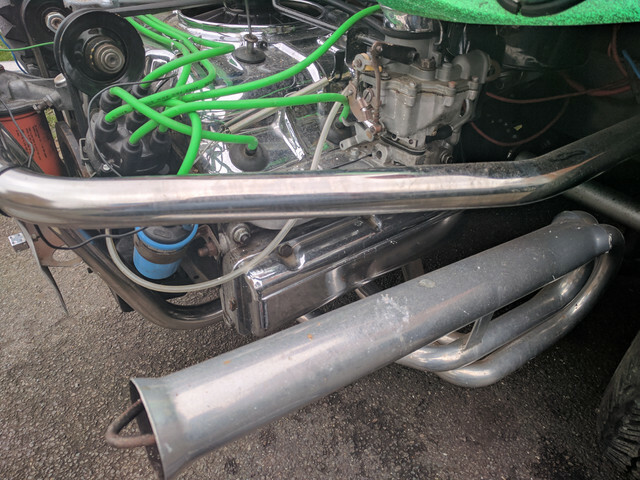 A very well known buggy throughout the Buggy forum and the MBC. A number of factors lead to it being for sale, amongst them being a French hot hatch addiction, a lack of use and a lack of space. Built between 2012-2014 and first MOTd in June 2014. Has covered approx 2500 miles since. The main part of my buggy is the engine. Engine is a 1964 110hp Chevy Corvair engine. This engine has had a complete overhaul/rebuild with many parts replaced/upgraded. New parts include pistons, rings, main & rod bearings, cam and cam gear, carbs, ceramic coated Otto exhausts, valves and valve train, two new rods (balanced and within factory tolerance to the other 4), alternator and other bits I've probably forgotten. Other work includes bored and honed (0.030" oversize) cylinders, polished crank journals with factory oil feed holes chamfered, and again, probably bits I've forgotten. Engine runs extremely well. It also has a set of chromed to wear and looks the part. It runs a std VW AB code gearbox which has had the differential flipped. Lime Green metal flake. An amazing colour, of which only perhaps 4 shells have been made by East Coast Buggies in this colour. 1kg + of flake in it, it need to be seen in.the sunlight to be believed. Has sidepods which are fitted. Am sure there is plenty I have missed. I will add some more photos later on. 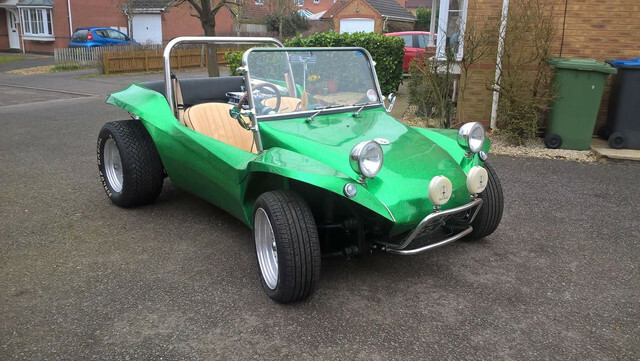 Whilst the engine really makes this buggy what it is, I'm fully aware it might not be to a lot of people's taste. I'm.prepared to offer the buggy for sale either with or without it. 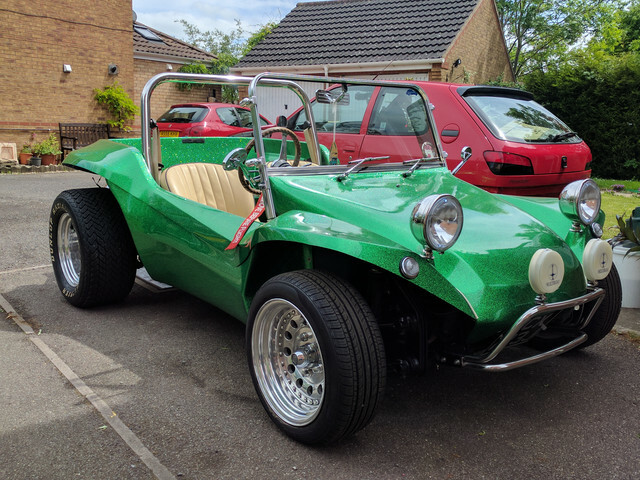 With it and as the buggy stands, £10k. Without the engine, and with a std VW engine and gearbox, £8.5k. Really love your buggy. Watched the thread as you went through the pain of building. Sorry but I’m going to ask again. Are you sure. So having had a think about things, a lot of soul searching, and a lot of getting cross about a lack of garage space, ill offer this once more, with perhaps more realistic pricing. Ive just not got the room for all my toys and bits. 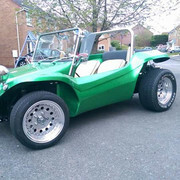 Its a massive shame for this buggy to sit in the garage and do less than 1000 miles a year. It needs to be out and about and be enjoyed by someone. Id love someone to take it on, and make it even better. Having said all of that, if i dont get what im after for it, then i will keep it and will have to somehow find a way (and space for everything). Yes, i suppose i could do that now but im keen to finish the 306 this year too, which wpuld require an injection of cash etc. 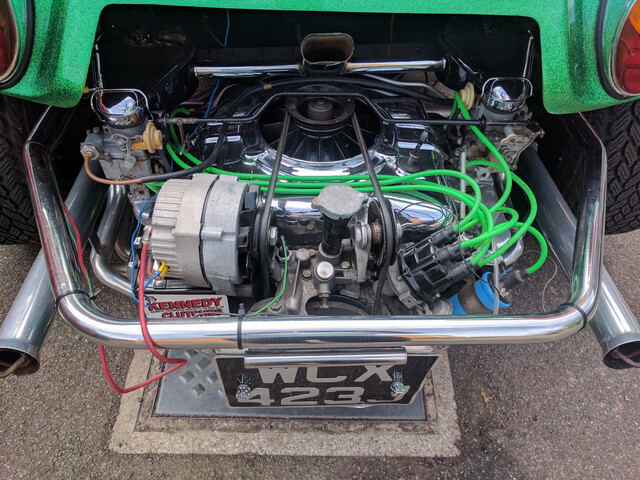 So, as it stands, with the Corvair engine, £9k, which to be honest, i think is cheap considering the engine and all the work/parts that have gone into it. Without the Corvair engine, and a std VW engine and box in it, £6750, which i also think is pretty reasonable. Open to offers pretty close to what im asking. Is it going in another buggy Ben? A guy called Chris from Leeds is having it. He is. Absolutely mad keen to get it delivered! Owner doesn’t say why it so quickly being sold and favours evening and night time shots which doesn’t begin to do justice to the colour. I think that I read on Facebook he may be having some health issues.